Find out some interesting facts about Finland, and print out the Finnish flag in various fun and useful formats for home and school. Finland is a Scandinavian country in northern Europe, which borders Sweden in the west, Russia to the East and Norway to the north. 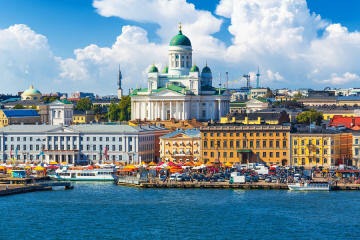 Helsinki was made the capital in 1809 due to its proximity to Russia. Architect Carl Engel designed the new city, including Senate Square, home to the Senate, University and Lutheran Cathedral. Finland is Europe's most heavily forested country, with forests covering 70% of the land. You could build a wall around the world 10m high and 5m wide with the wood! The 187,888 lakes cover another 10% of the country. Lake Saiima, the largest in Finland, is home to the rare Ringed Seal, of which there are only 310 in the world. Finland was a largely agricultural land and part of the Swedish empire for seven centuries. Between 1809 and 1917 it was a Duchy of the Russian Empire. The Republic of Finland gained independent in 1917, after the Russian Revolution. Carl Mannerheim is celebrated as a hero from this war and World War Two. Finns are among the world's biggest coffee drinkers. The average adult drinks 4-5 cups a day and likes to dip pastries in their drink - yum! Finland's educational system is widely admired for excellent results. Teachers are highly qualified and respected in Finland. Finns are fond of taking a sauna in a very hot room filled with steam from heated rocks. There are 2 million saunas in this country of 5.4 million people. Finland won the World Ice Hockey Championships in 2011, beating rivals Sweden 6-1 in the final. Pesapollo is the national sport, played with bat and ball like rounders. Rovaniemi in Lapland is the official residence of Santa Claus. Visitors can expect to see the northern lights and in summer experience the midnight sun. Finland has produced two winners of the Formula One championships, Mika Hakkinen and Kimi Raikionnen. The famous Moomin fairy tales by Finnish illustrator Tove Jansson were originally written in Swedish although published in Finland. We have a page full of activities about famous Olympian Lasse Viren.